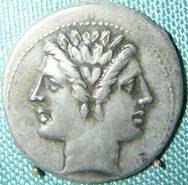 The first month of the year is named after the two-headed Roman god Janus, shown here in an ancient Roman coin. One head looked back, the other looked forward. One way to look back and look forward is with a Plus/Delta reflection, which can be done individually or in a group. Divide a flipchart or piece of paper into 2 columns. Above the left column write “Plus”; above the right column write “Delta”. Ask what went well in 2014, and write those bullets into the Plus column. And think of what you would like to change next time – write those bullets into the Delta column. Notice – and this is important – you’re not making things “wrong”. You’re asking, “What would I like to change?” That’s why the column is called “delta”, not “minus”. This allows you to learn from all of your experiences. We coach clients to never use the word “fail.” When they try something, they get a result. If they don’t like the result, they can change something and try again. And if they get the result they want, they can still change something and try for a different result the next time! That’s how people, and organizations, learn. Learning organizations consistently outperform traditional organizations. And they’re a lot more fun to work in! All of us at PCG wish you and yours a rewarding and “learning” new year. Nice way of reflecting on one’s experiences in a non-judgmental way. What you’ve accomplished and feel good about and where you want to grow or move in another direction takes clarity of vision and the courage to not give up.